The culinary landscape in Kuala Lumpur breaks new grounds as the Caffeinees Group of restaurants launches the highly anticipated Yamaguchi Fish Market today, a concept that reimagines the seafood marketplace to serve the freshest catches in town. Yamaguchi Fish Market is inspired by Karato and Tsukiji Fish Market in Japan where the team sought to bring not only the highest quality and freshest ingredients to seafood lovers but the energetic spirit of the vibrant market as well. 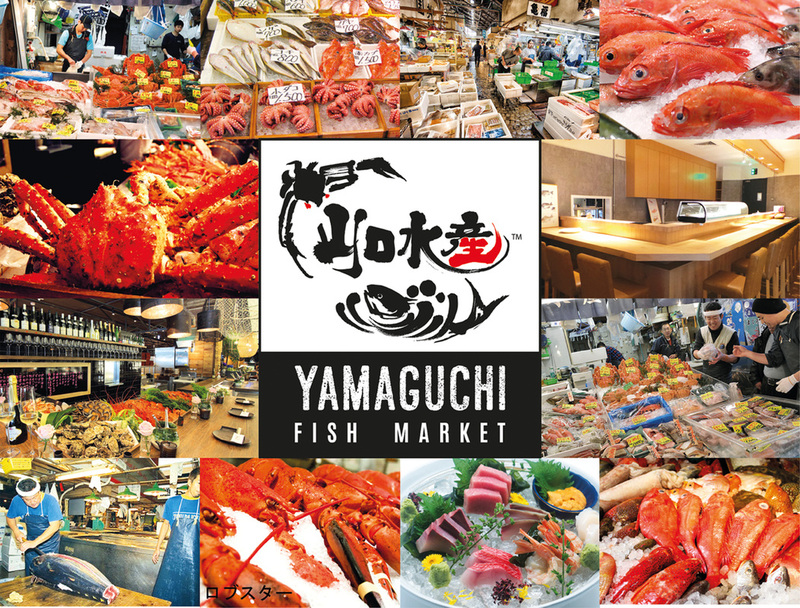 The tanks of Yamaguchi Fish Market is filled with fresh catches from seasonal fishes to uni and king crabs that guests can either opt to dine-in and enjoy in a variety of delicious styles or purchase back home at wholesale prices. Diners will delight in a great variety of fresh-from-the-ocean sashimi and shellfish that the team directly picks up twice a week from the harbour and serve on the extensive and carefully curated menu. Yamaguchi Fish Market’s signature sashimi and grilled seasonal seafood platters is a rich mix of sashimi, shrimps, king crabs, oysters, clams and abalone. For palates of comfort food, the salt baked tai fish, Yamaguchi eel rice and seafood nabemono takes centrestage. As a marketplace that offers variety in abundance, Yamaguchi Fish Market also takes a local spin onto the ingredients by opening up its menu to offer dishes cooked in local flavors such as salted egg, garlic steam and superior soup. “Yamaguchi Fish Market aims to be a must-go culinary destination and tourist attraction with our seasonal menu of fresh, sustainably-caught seafood that will satisfy a wide range of palates. A thorough process starts with the freshest seafood and best ingredients. We have built in tanks to keep our seafood live so that it will be served at the optimum freshness. Our experienced chefs transform these ingredients into the best dishes with new and refreshing flavors and textures,” said Chris Chang E, Group Managing Director of Yamaguchi Fish Market. “The city has responded so positively to the quality food and service we introduced at Chiyo Sushi in Eight Gourmets Gala. Now guests to Yamaguchi Fish Market should expect the same – a one of a kind dining experience presenting the freshest seafood, outstanding service and a stunning atmosphere,” he added. Yamaguchi Fish Market is open after a complete renovation of well-known Caffeinees restaurant, to include a second alfresco dining level overlooking the Petronas Twin Towers, city skyline and lush greenery. Making the venue ideal for meetings, a leisurely meal or a celebration. Inside the restaurant, tanks of fresh seafood adorn the space in reminiscence of the fish markets in Japan together with a raw bar, drinks and gift corner. The light aesthetic served to open up the space and refined, wood furnishings and metal accents provide a polished yet inviting upscale setting. The 5360 square foot space seats 450 guests at the upper dining level and 150 pax on the ground floor. “I’m honored to be part of an event and team that celebrates perfection in every aspect. Yamaguchi Fish Market is my go-to place for fresh, delicious seafood delicacies with a matching spectacular ambience when I visit Malaysia, “said Wu Chun.